Excellent for using at home and also very accurate. Very easy to use and without another’s help. Easy to adjust for different arm sizes. Your blood pressure is important because the higher your blood pressure is, your risk increases for further health problems down the road such as diabetes. Keeping your pressure down can help keep your diabetes at bay. When you have high blood pressure, it increases strain on your heart and your arteries. Over a period of time, this strain can cause your arteries to become to become thicker and less flexible, and at the same time weakening them. You don’t want this to happen. If your arteries should become less flexible and thicker then they will become narrower, which will make them more likely to become clogged up. If an artery becomes completely clogged up, or clotted, this can lead to a stroke, dementia, heart attack, or kidney disease and more. In extreme rare cases, if your artery has become weakened, the extra strain may eventually lead to the artery bursting. This can also cause a heart attack or stroke. You do NOT want this. CHECK your blood pressure! What Should You be Looking for When Searching for the Blood Pressure Monitors? As with any product today, there are always inferior, middle of the line and top notch choices. You’ll want to pick from a manual or digital blood pressure monitor. Digitals are extremely popular today and accurate, but you don’t have to rule out the manuals either. So when you do make your choice, you’ll want to consider all the features of the top monitors. Consider how large your arm is first. The Omron blood pressure monitor cuff accommodates a wide variety of sizes. You want a monitor that is easy to operate and is accurate and that’s what the Omron 5 delivers. Omron makes two different models that people can chooses from today and they are the Omron 5 series and the Omron 10 series. Omron 10 provides multi-colored indicator lights that clearly shows difference when readings are being compared. Omron 10 stores more readings if it is connected to a smart phone. Because of this a person needs to review each to see which model provides and will fit their individual needs. The Omron 5 is favorably my choice. This is as good as any of the monitors used in the hospitals some nurses have said. I did extensive research before I bought this Omron 5. I like the fact that it’s easy to use, compact, and the screen is easy to read and more affordable. But you can’t put a price on your health. So what is the best blood pressure monitor? Clear and simple it’s the Omron 5! Your health is important and checking your blood pressure is an important part of that. Don’t wait to go to the doctor to have it checked. Have the convenience and relief of checking your pressure at home and knowing what it is anytime you want. Well done on a great review for this blood pressure monitor. Its such an important health issue today and will become very useful as we go forward. Its more especially important for men,as they are so reluctant to go to their GP for a check up. Hey Phil, you’re correct. A lot of men don’t go to their doctor. There are ways of keeping check on some health issues at home and the Exerpeutic monitor is one of them. I think everyone should have a blood pressure monitor on hand. It eliminates the guess work. Thanks for the thorough review, Rob. I’m surprised at how reasonably priced this unit is, considering its many positive features. Maintaining healthy blood pressure is so important and it’s refreshing to know that people who have BP concerns have access to a portable, easy to use, affordable device. It’s a shame this doesn’t come with an AC adapter, but I’ve checked and they can be purchased online for around $5. Hey Joanne, this a great monitor and reasonably priced. It is easy and portable and you’re right. You can purchase an ac adapter for it. It’s not a big deal for me because the batteries last a long time. I really like the features and I’m happy with the Omron 5. HI RobSciubba, I had one already in my house Model HEM -7200 from Omron too. Definitely easy to use, just wrap the tester around the arm and it will automatically apply pressure to the wrapper just by pressing the on button. just wait for few second and the reading is on the screen. Simple and easy to use instrument, every household should have one of this at home. Yes Omron makes a great product. It’s really worth the investment of knowing what you’re pressure is in the convenience of your home or on the go. It doesn’t come any easier to use than this. I agree that every household should have one. what a great little machine, so helpful where you have also put the pros and cons. I agree checking your blood pressure is important and having this gadget at home means you can check it everyday and jot it down in your notebook. It would be great for my husband as he never goes to the doctors ( MEN lol ). Do you know if it would be wise to use it everyday or every other day?, or once a month?. I may even invest in one as they are a good price. I love this monitor. It’s exactly what I need and wouldn’t be without it. I go to the doctor, so not ALL men don’t go. LOL. The Exerpeutic monitor is the best monitor as far as I’m concerned and it’s very accurate. As far as usage? Two times in the morning, two times in the evening a few times a week is sufficient usage. You don’t need to overdo it. Hi Rob, I thought that I was on the wrong page but was really glad that I read your article. Blood pressure has been an issue in my family for a long time. It is great to see that a company actually makes a home device that is relatively inexpensive. Thank you for the thorough review. Blood pressure is nothing to fool around about. I think we all know that. I feel that every home should have their own monitor and check their own blood pressure a few times a week so you are aware of what your pressure is before you head for the doctor’s office. This blood pressure monitor seems reasonably priced and has lots of good reviews on Amazon. I think it’s amazing that we live in an age where we have the ability to check our blood pressure in our own homes! It appears that the warranty is 2 years on the actual device and 1 year on the cuff but extra warranty can be purchased through amazon. Still at that, for the low price, I think the device would definitely be worth it. It’s nice to know what your blood pressure is without having to go to the doctor’s office. This monitor is perfect for home and away. It’s extremely accurate and portable. Price is right and it is easy to use. Thanks Isam. Blood sugar and blood pressure are so important. Once I decided to take my own blood pressure, I knew I had to get a very good monitor so I could check my pressure at home. This Omron monitor is accurate and perfect so that I can take it with me when I go away. I was looking for a good blood pressure monitor and it looks like I found it thanks to you! Actually, I am helping out my mother to get one because her blood pressure is too high. She has been suffering from this for a long time now but never bothered to get a monitor lol. As you say yourself in this review, monitoring blood pressure can be an important part to make sure you are staying healthy! Yes it’s especially convenient to take your blood pressure at home and on the go. It’s also very important. I think everyone should have one and the Omron 5 is the best one on the market as far as I’m concerned! Almost my entire set of relatives on my fathers side are diagnosed with high blood pressure. I used this on my father while he was alive and now I use it on my grandmother and my uncle…and basically everyone else in the family. They think a student doctor is as good as going for a checkup at the pharmacy or doctor’s office so they come to the house for routine blood sugar, cholesterol and blood pressure checks. Hey Crystal. Blood pressure is important to take as you know so having one on hand is a definite positive. I always liked the Omron 5 and it’s about the best one out there. I never had a problem with it and knowing my blood pressure at all times makes life a lot easier. It’s important to know your blood pressure especially if you have diabetes. Thank you for your comments! This is a very detailed and informative article, this lets you know exactly what your getting for your money. You even outlined some key reasons for keeping your blood pressure under control, keep up the good work. What are some examples of really good manual blood pressure monitors that can match up to the good digital ones. This is about the best monitor out there today. It’s easy to use, portable, and reasonably priced. It’s important to know your blood pressure and with the Omron 5 you can take it anytime anywhere. I don’t like or recommend the manual ones but Omron does have manuals that I’m sure would suffice. Thanks for your comments Aldane! Thank you for this thorough review of this product. It seems reasonably priced, but do you have an “ideal” recommendation? My in-laws are both diabetic and struggle tremendously to control their sugars. I’m considering getting something like this for them, or perhaps even just having at my home for when they visit. Do you have a “must have” recommendation? Hi Randene. I did a lot of research on blood pressure monitors and the Omron 5 IS the ideal recommendation in my opinion. I too, have diabetes so it’s important for me to know that my blood pressure is fine at all times. Omron is a very well known and trusted company and this particular monitor performs the best from all the monitors that I checked out. It’s great for traveling so you can always know what your pressure is at all times. I hope this answers your questions. Thank you! I never realized how important your blood pressure was. You are right about not being able to put a price on your health. It does seem like a nice device to try out though. Your review seemed a little vague though. I was wondering if you have more on reasons to know your blood pressure. Is it important to know your blood pressure even when you don’t diabetes? Well, thank you for the great post. Your blood pressure is extremely important and vital for your health. It doesn’t just have to do with diabetes. There are many different health reasons for checking your blood pressure and having in the normal range. High blood pressure can cause strokes, and heart attacks among other diseases. This device does a great job at giving you an accurate blood pressure reading each and every time. This is a great review you have done on this product. I have family members who may need to have a device like this and since you have done such a great job on this review, I will give them this information. I like the advantages that this product has to offer. I do notice it says in the cons section that there is no ac adapter. If the batteries are low, will this product give an indication of that? If not, will you lose all your previous readings? Once again, thank you for this great review. It is very helpful. Hi there Yvette 🙂 This product is great and portable to take your blood pressure readings wherever you go. It’s accurate and very moderately priced. There was a mistake about the AC adapter. That was for a different model. This does come with the AC adapter so there’s no worries. I apologize for that error. Thank you for the heads up! Thank you for this very helpful and informative review! For a long time now, my personal doctor has nagged me to get a blood pressure monitor. And my exposure to the type of monitors were all the old types. You know what I mean. The ones that are cumbersome and not very accurate (to me). I am glad to know about the Omron 5, thanks to you. It does look easy to use. And I agree, being digital it is more accurate. Definitely worth considering and getting. Thanks! Hi Timotheus, I kind of had a situation with getting a blood pressure monitor but it wasn’t my doctor who was nagging me. It was myself! 🙂 Once I got the Omron 5, I knew I made the right choice. All the reviews I read pointed to this one. It’s easy and reliable and at least I don’t have to wait to go to the doctor’s office to have it checked! Maybe you can pass this on to others to help them too. Thank you so much for your time! Hi David! I think everyone should have their own blood pressure monitor but it has to be one that is accurate and reliable. The Omron BP742N-5 is one that I searched high and low for. I wanted to make sure I had the best and Omron does make the best as far as I’m concerned. Thanks for sharing! Great article. I have had several blood pressure monitors through the years but this one clearly sounds better and it also has a fantastic price. I think I paid $49.95 for one that didn’t do everything this one does. Hey Kevin, I did a great deal of research before I purchased this blood pressure monitor. I just needed a product that was going to be accurate and affordable. When you think about it $39.99 is very reasonable for you to keep track of your blood pressure which is so important for your health and diabetes. Thanks for sharing! It is so important to check your blood pressure, especially after a certain age, but for all ages in general. I really think you have gone above and beyond in selecting and reviewing such a great product. It is incredible what this monitor can do and it has amazing features. The price is very reasonable, I think is a great value! Thank you for the great information here. Hi Pablo 🙂 It is vital to know your numbers both for blood pressure and for blood pressure. And it is more important as you age. I always search for the best possible product especially when it comes to health. What’s more important than your blood pressure? I believe that you can’t put a price on your health and the Omron 5 is the best as far as I’m concerned! Thank you for your thoughts! Thanks for this review. We have a different home model for blood pressure, that my husband uses. Our doctor wants him to take it regularly. Only we find the readings are a little off from the doctor’s office. She said it was ok. She just wants to see the overall average from day to day. Do you find the same with this model? Hey Suzanne, There are many different types and models of blood pressure monitors out there. I don’t think any model is going to read the same as the one in the doctor’s office. But the fact is, if they are close in readings, it shouldn’t be a huge factor. I do find the Omron 5 to be extremely accurate and that’s what’s important to me. Thanks for your insight! Straight to the point and pros and cons of each of your top picks nice job. website looks good to I’m still getting there with mine. Well, I have to say, the Omron BP742N 5 definitely seems like the way to go. The price is great, and I’m super excited, because with my Dad having high blood pressure, and I agree with you, I don’t want him waiting for his doctor’s appointment. Thanks for putting all this information together for us. I appreciate it. Hey Babs 🙂 It’s so important to have your blood pressure checked regularly. That’s why I recommend the Omron 5 BP742N to keep an eye on your blood pressure right there at home and on the go. I have been looking for a good portable blood pressure monitor for my parents, per doctor’s orders. I haven’t been able to find one for less then $60. I have seen the Omron series before, but I had no idea they were under $50. My mom has had high blood pressure for many many years, and recently we found out that she has some hardening of the arteries in her brain caused by high blood pressure. Thanks for the review it’s been very helpful for me. I think that everyone should have their own blood pressure monitor so they can take their blood pressure anytime at home or on the go. I do hope your mom is okay. I did my homework on monitors and I have to say that the Omron-5 is the best out there. I only recommend a product that I believe in and this is it. It’s so important to know what your blood pressure is and this machine is extremely accurate and works perfectly! It’s a great idea to have your own blood pressure device at home. I never realized how well priced to own your one is. We just get used to only having our blood pressure during gp appointments so this is great to know. As if with most things nowadays, its not surprising to see a blood pressure kit that can be compatible with a smart phone – fantastic! Great review! Thank you! Maybe years ago it might not have mattered as much, but in this day and age having your own blood pressure monitor at home is a fantastic idea! If you are monitoring your blood pressure at home regularly, you won’t have to be surprised when you have it checked at your doctor’s office. The Omron 5 is extremely accurate and easy to use. There’s no second guessing when using it. Hi and thanks for this really detailed review of this blood pressure monitor. I like how you have done some comparisons with similar branded products and also how you visuals break up the text nicely. I guess the drawback is that the wireless connection isn’t amazing, but if that’s the worst thing, then for the price, this is a pretty good buy. There are always more than one product that will do the job. But I feel that blood pressure is important and especially if you have type 2 diabetes. I researched this monitor and the reviews sold me. I want something that is reliable and affordable and the Omron 5 is it! It’s easy to use, portable, and very accurate. My blood pressure went up some years ago and I’m supposed to check it everyday. The Omron blood pressure monitor looks very inviting. Of course it looks much better than the one I am currently using. I really love the fact that it keeps the last 100 readings! Is it sold in the U.K.? Sorry to hear your blood pressure was up, but having the Omron 5 at home and when traveling would make life easier for you. With type 2 diabetes, it’s more important than ever for me to keep my pressure checked all the time. It’s very accurate and a cinch to use. I’m not sure if it’s sold in the U.K. You can check and see. I’m sure that it is! The Omron upper arm blood pressure monitor is actually a great recommendation and it’s a simple gadget to use. My mom has one and she uses it regularly to make sure everything is okay. It works great! If there is a faulty reading, a simple battery change takes care of that. It’s unfortunate that most people take it for granted that they are in tip top shape, since they look good on the outside. But clearly it’s important to know what’s going on inside our bodies as well, even though we might look healthy on the outside. A simple blood pressure test can give some insight into what might be going on inside our bodies so that we can take precautions where necessary. The fact that the readings could be stored if it’s connected to a smart phone, allows for easy comparison and that’s a plus. The Omron upper arm blood pressure monitor is great for anyone who is looking to manage their health better, especially so if they have a history of high blood pressure in the family. It’s really an inexpensive way to ensure everyday health and wellness. I just got to the point where I wanted to be able to take my own blood pressure at home or on the go and not just when I had a visit to the doctor. 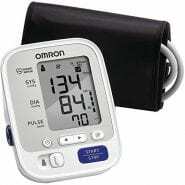 So I went and did research and found the Omron 5 blood pressure monitor to be the best and purchased it. I wasn’t sorry because the majority of the reviews were right on. It’s easy to use. Very functional, with accurate readings and if a reading is off, it’s because the batteries need changing. It’s that simple! Blood pressure and diabetes go together so you want to make sure your pressure is in the normal range and the Omron 5 is awesome! The natural ways to lower blood sugar levels are all we need to stay healthy. As I am reading hereI am scared about my health. I read that when the artery is clogged it can lead to some problems and one of the problems I am facing are my kidneys, they become painful all days. Once I drink 3 to 4 liters I become okay and I am really wondering if they are having a problem. I guess I have to buy the Omnon blood pressure monitor. Having a normal blood pressure is vital to staying healthy because of heart and cardiovascular issues and diabetes among a few. You want to avid diabetes at all costs. Drinking plenty of water will help, but it takes a lot more than that to prevent diabetes. Eating healthy and exercising such as walking will help and also help to keep your blood pressure down. The Omron 5 is extremely beneficial with its’ accuracy and ease of use. It’s about the best one out there as far as I’m concerned. I love it!